Christopher Columbus is often known as an Italian explorer, colonizer, as well as the man who “discovered” America. He was born approximately between October 31, 1450 and October 30, 1451 in the Republic of Genoa, which is now Italy. His interest in exploring began early and by 1473, he was an apprentice to a business agent, embarking on trips to bring cargo to Europe. His career in travel continued in the form of trading. Columbus, which is an anglicization of his original name, studied history, astronomy, geography, the Bible, and several languages (“Christopher Columbus”). The circumstances which gave rise to Columbus’ voyage began when the Silk Road became dangerous for Europeans. India and China were vital trade partners as they had resources such as spices, silks, and dyes. The Silk Road was an important trade network which connected Europe to those eastern lands; it became dangerous in 1453 around the fall of Constantinople to Ottoman Turks who were aggressive toward the west (“Silk Road”). In the 1480s, Columbus was intrigued by Paolo dal Pozzo Toscanelli’s idea that sailing westward from Europe would be the faster route to the Indies. Columbus brought his plan to Portuguese, Genoan, Venetian, and English royalty; they all rejected it, claiming that Columbus’ estimates were inaccurate and he was heading for certain death. Finally Columbus brought his plan to Spanish King Ferdinand II and Queen Isabella I in 1486. It took four years for them to finally accept it. In 1492, Christopher Columbus set sail for his first voyage out of a total of four (“Christopher Columbus”). The first reading is an excerpt from Journal of the First Voyage of Columbus. Unfortunately, the original journal kept by Columbus has since been lost. What remains is a mix of Columbus’ original abstract, transcribed by Bartolomé de las Casas, and first-hand observations from Columbus’ son Ferdinand. There are times when the narrator is Christopher Columbus himself and other times it is Ferdinand Columbus (“Christopher Columbus’ Journal”). The passage documents Columbus’ intentions for his voyage, his embarkation on August 3, 1492, the details and difficulties of the journey, the first contact with land in the Bahamas on October 11, and the Spaniards’ primary interactions with the “Indians.” The second reading is from Narrative of the Third Voyage. In this passage, Columbus engages in discussion on how, according to this observations and experiences, he believes the Earth to be pear shaped. It is a fallacy that Christopher Columbus discovered America, as it was already inhabited by many tribes of people. In addition, other non-natives before him had contact with the Americas, including European fishermen and Norwegian settlers (Olson and Bourne). However, it is still important to discuss the voyages of Columbus as he set the European settlement of Central, South, and finally North America into motion. Following these expeditions were the conquering and genocide of millions of “Indian” tribes and the birth of the slave trade. Columbus’ initial interactions with the native people of America would set the tone for European-Indian relationships for centuries to come. By reading these primary source documents from Columbus’ voyages, one can be critical of the modern portrayal of Columbus, the alleged discovery of America, and the nature of history itself. How does Columbus’ journal differ from how his voyages are discussed in historical discourse? Olson, Julius E., and Edward G. Bourne, eds. “Summary and Background of Journal of the First Voyage of Columbus.” Introduction. Journal of the First Voyage of Columbus. N.p. : n.p., n.d. N. pag. American Journeys. Web. 14 Sept. 2015. Phirosiberia. 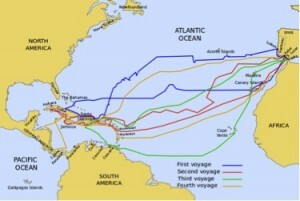 The Routes of the Four Voyages of Christopher Columbus. Digital image. Wikimedia Commons. N.p., 28 Dec. 2009. Web. Wikipedia contributors. “Christopher Columbus.” Wikipedia, The Free Encyclopedia. Wikipedia, The Free Encyclopedia, 12 Sep. 2015. Web. 12 Sep. 2015. Wikipedia contributors. “Christopher Columbus’ journal.” Wikipedia, The Free Encyclopedia.Wikipedia, The Free Encyclopedia, 22 Aug. 2015. Web. 14 Sep. 2015. Wikipedia contributors. “Silk Road.” Wikipedia, The Free Encyclopedia. Wikipedia, The FreeEncyclopedia, 6 Sep. 2015. Web. 12 Sep. 2015. The Open Anthology of Earlier American Literature: A PSU-Based Project by Hannah Hounsell is licensed under a Creative Commons Attribution 4.0 International License, except where otherwise noted.